When I was reading this book I read half the chapter focusing on agrofuels and the next morning there was one of the companies mentioned with a sponsored advert on my twitter feed. Was it there before or did I just notice it because of my awareness around the topic? Or is there some greater capitalist conspiracy of them getting into your mind? I’ll let you decide that answer but what I do know is that at 07:10 on a Tuesday morning it really narked me off. As well as discussing agrofuel The Food Wars also covers poverty, agrobusiness, imports, exports, the general food industry and the political groups that try to impact on food production and ‘stability’. Walden Bello sprung into action to write this book when the 2008 financial crisis hit and got supported by his employers, colleagues and those that are also in this area of expertise to power ahead and highlight how the food industry and food prices both partly led to the crisis but also how they would be impacted by that financial crisis and any others that would follow. If you haven’t read about these topics before this book is easy enough to get into and understand but if you feel daunted by the concept I’d certainly start with something like Food for Beginners as, whilst it focuses specifically on the issues on the African continent, it mentions several of the topics and policies included in more depth in Bello’s book. The book is split up into seven chapters that all focus on different topics but are able to reference things and places mentioned in previous chapters as well to allow for integration and further understanding by the reader. Despite this, each chapter could easily be read as a standalone for extra information on a certain area of the food industry or a specific country. Personally, I find non-fiction books that find ways to weave and transition topics from one chapter to another to be the most enjoyable and understandable to read because it really helps for the arguments of certain sections to get into your head instead of you reading it and moving on to something completely different two lines later. The first chapter acts as an introduction to the way Bello will be approaching the contents in his book and gives an explanation as to what he will be meaning when referring to peasants and different social and political groups in the food chain. The later chapters focus on different types of production in countries like Mexico, The Philippines and China before discussing agrofuel and concluding with what needs to be done going forward and what may happen if nothing is done to overturn the status quo. It’s a traditional style for a book but the flow from one to the next is beautiful and whilst it allows the reader to easily glide from one to the next the way it is written brings about a level of conscious stirring and challenges too. Whilst each chapter tells a different story as to what happened to each country the results are the same; restructuring plans and financial plans put in place by external sources has caused them to go from net exporters with surplus food in storage to being overall importers of food and instead exporting things like cut flowers that the farmers and lowest income groups cannot survive on. The plans to make these changes, largely from the World Trade Organisation, the World Bank and the IMF, were done to ‘help’ the countries to bring down their debt, decrease public spending and agriculture initiatives and wait for the private sector to climb in but in all three cases it ignored the peasants need for food and a countries need for back up supplies. The only people that have benefited from these restructuring methods seems to be big business and multi-millionaires; it is another example of capitalists attacking the poorest, weakest and most vulnerable in society by bullying those that are meant to protect them. All of this feeds into the sixth chapter, regarding agrofuel, and how countries that are now already starved of resources and reserves are being encouraged to grow things that can be used as a fuel replacement. These products are not food that is going to waste or already being produced where the conversion into fuel wont have an impact on the food consumer of the world; they are having to hack at rainforests, destroy land not usually used for agriculture and are using things like corn to make these ‘better’ fuel alternatives. It is clear that they are not better for the food consumer or for the environment but again to big business with the likes of Bill Gates and Richard Branson entering the agrofuel sector. 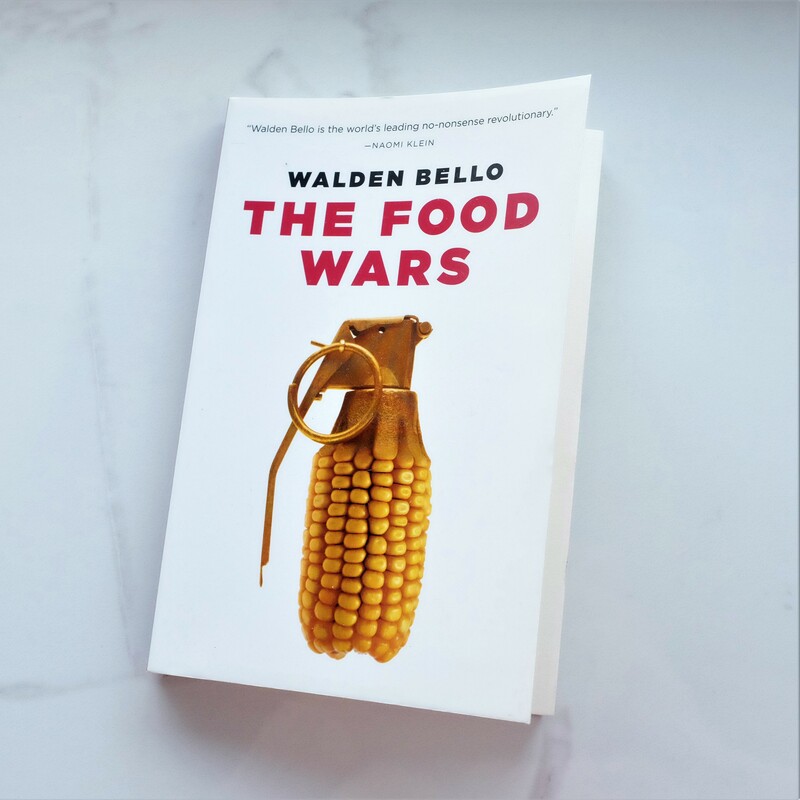 Throughout the book Bello also refers to a number of other academics and professionals that look in depth at certain regions and countries struggling with the food crisis and quotes them to increase the reputability of Bello’s claims and statements. At times though it can feel like he is over-quoting the same people but when you take a careful look at the citations and see where all his facts and statements are coming from you can see that this is far from the case (you need to be the sort of person that has the patience to flick from page to the back of the book to check every single citation though and when there’s a lot of them that involves some dedication). The final chapter, whilst also looking to the future and figuring out what might happen next, provides three short case studies of people that did something specific for the movement; suicide, time in prison and the creators of powerful movements. It gives the reader a deeper understanding of the level of crisis that people are finding themselves in whilst providing additional information on some countries not mentioned that much throughout the book. by the time you get to the last chapter you feel slightly numb as a reader because of the realisation of just how awful everything is so the case studies don’t quite have the same punch that they might if you read them out of context but they do pump you up to want to read about the next steps in this almighty battle. As Bello is based in the US and, like most markets, the US is overlord in the food market the book only touches upon the EU and the UK. It shows that there is mild resistance to things like agrofuel in the EU but that they still want to create targets, lease land and get involved in anything that gives them economic and political clout. This attitude has continued to prove to be dangerous and governments have pushed ahead with new initiatives that do little for the environment on a real level, benefit people inside or outside the EU or to help with the financial crisis of the late 2000’s or to prevent the one likely to happen in the upcoming months or years. At the end of the book there is a great sense of need to sit down and think about what the country you live in is doing in terms of food exports and imports, is it fuelling the agribusiness trade, is the energy it really wants to promote clean and what is happening to the workers? It doesn’t take you look to scratch the surface and realise that almost every country is to blame for this food war. But the real food war is the big business vs the rest and that’s exactly how they want it to be. Whilst this book comes in at less than 200 pages it did take me some time to read, not helped by me being in hospital in the meantime, and it is one of those books where you do need some time to process each sub-section and chapter properly. I found it to be an accessible read, as somebody without a specialism in economics or the global food markets, and a great summary of the topics covered. It has given me enough confidence to pick up a book that goes into the food situation of one specific country more and know that I will have enough knowledge to be able to understand not only the content but some of the organisations, groups and reports that they are likely to refer to. If you have read this book, I would love to hear your interpretation of it in the comments below. Otherwise you can follow me on Goodreads or Instagram to see what my current reads are. This entry was posted in Books, Culture and tagged agribusiness, agriculture, book, book blog, book blogger, book bloggers, book review, Books, eating, finances, food, food blog, food blogger, food bloggers, growing, lblog, lblogger, lbloggers, life, Lifestyle, lifestyle blog, lifestyle blogger, lifestyle bloggers, poverty, production, The Food Wars, world, world economics. Bookmark the permalink.